Peter has served his prison sentence trying to be nameless. But on his release, Peter becomes entangled in the life of British Museum professor, Alex, whose brother was found hanged under Blackfriars Bridge. Investigations into the death lead them into the secretive world of Freemasonry and its passion for collecting ancient Egyptian artefacts. Alex calls on Beth, his finest student and an expert in Egyptian hieroglyphics. From London to Paris, New York and the ancient temples of Egypt, they lead a frantic race to uncover the clues. As Peter and Beth get closer to solving the mystery of the murder, death stalks their every move. To survive, Peter must discover qualities about himself he never knew he had ... and learn to trust once more. Investigations into the death lead them into the secret world of Freemasonry and its passion for collecting ancient Egyptian artefacts. Alex calls on Beth, his finest student and an expert in Egyptian hieroglyphics. Nick Hawkes (D.Min) is Pastor at Rivergate Christian Fellowship in Adelaide, SA. He is the author of a number of books including Basic Christianity, The Dance between Science and Faith and The Country is Different. He is also the author of the Basics video and workbook discipling series. Nick is a noted speaker who has been invited to preach in America and India. He is married to Mary and has two adult children Michael and Katie. 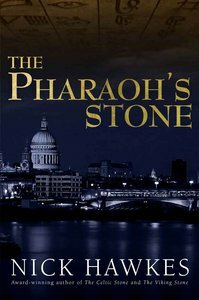 Customer Reviews For "The Pharaoh Stone"
I thoroughly enjoyed this novel. I love the way the author brings the world and history to life, taking me to places I have never been. The characters are vivid, flawed, relatable humans on a journey of growth. I loved sharing Peter's journey of self-discovery as he grappled with his shame, worth and significance. Some of the discussions between characters, especially between Alex and Peter, made me stop and think. The profound thoughts expressed about science and theology we so good I had to share them with my family. The positive difference the main characters made to the world and the justice they brought about was deeply satisfying. Intensely suspenseful at times, my interest was held throughout the story. I have loved all three of Nick Hawkes' novels, and know I can depend on an interesting, moving, thought provoking, quality read.